A product’s success depends on how well it is marketed to the people. Companies come up with several ways to make the product attractive and worth the people’s money and attention. But sometimes, the success of the product does not lie in one company alone. Some companies join forces with other companies to further boost a product’s presence in the market. 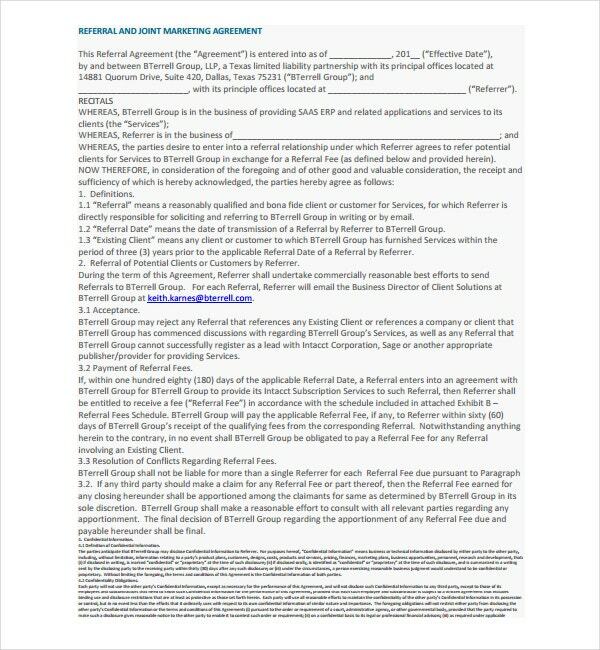 You may also see marketing agreement templates. To do this, two companies have to come up with a joint marketing agreement. This kind of agreement allows them to think of new strategies together to come up with new ways of promoting the product. A joint marketing agreement samples usually happens when two companies are serving the same kind of consumer. 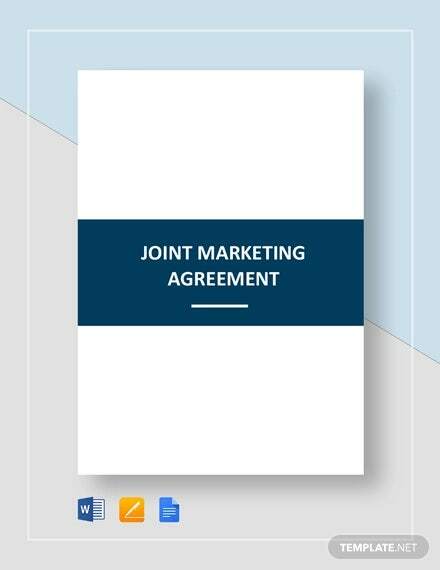 There are a few things to add in when writing the joint marketing agreement. Each part serves as a single backbone of the whole document. It must be read carefully. After writing, it is a must to edit and proofread the whole thing. 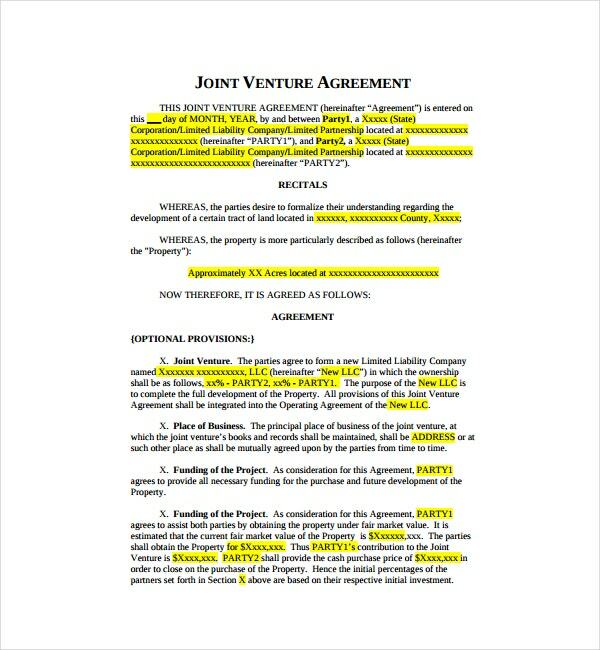 You may also see printable agreement templates. In the introductory part, identify the companies involved in the agreement. Give them names so they can be referred to these later on as the agreement is slowly being completed. The company addresses and contact numbers of both companies should be identified as well. You may also see confirmation agreement templates. The next part of the agreement is the description of responsibilities of both companies in the agreement. It is a detailed breakdown of what they have to do once the agreement goes effective. It is expected that both parties will comply with what is stated in the agreement. Each party should know how to carry on their assigned tasks and face responsibility for it if something bad happens. You may also see sample service agreements. 3. Describe the marketing activities to be done. The next thing in this agreement is to describe the marketing activities to be undertaken by both companies. This is a shared effort so everything must be done together and accordingly. Every marketing activity must be decided and agreed on by both parties. You may also see sample agreement templates. As part of the business strategy, marketing data is always available and be subject to further study. Every data should be shared by both parties so they can make a list of strategies in marketing products. Any part of the marketing agreement and the processes of combining strategies should be kept private. There is a need to draft a confidentiality agreement for this. No one should know how you do the business together, except for the people with the same ranks in the company such as yours. The agreement should include a prohibition of competition against other companies. They are not allowed to enter into a similar agreement with other companies no matter how big or small it is. You may also see free agreement templates. Provide a part where the parties can sign after agreeing to the terms and conditions. Usually, it asks both parties if they agree with the terms and conditions before putting their signature in. You may also see simple service agreements. Going into a joint marketing agreement reduces the cost for both companies in spending money for product promotions. It goes in two ways: one company provides the funding while the other does the work, or both companies split the funding and the marketing effort is done by an outside resource. The agreement outlines the cost and expenses of each marketing effort to be done. It is preferred by businesses who are struggling with financial costs and want to keep their spending to a minimum. You may also see marketing agreements. Companies who have the same vision and goal go into a joint marketing agreement. This is the part where they both feel the need to reach to a wider range of customers and improve their brands. But they also recognize the fact that they can’t do it alone. Going into joint marketing agreements give them some leeway in planning and coming up with new strategies to promote the product well. For example, a music streaming company partners with record labels to have a digital streaming and copies of new music that becomes available for consumers. They are both serving the same type of consumers, which are music fans. 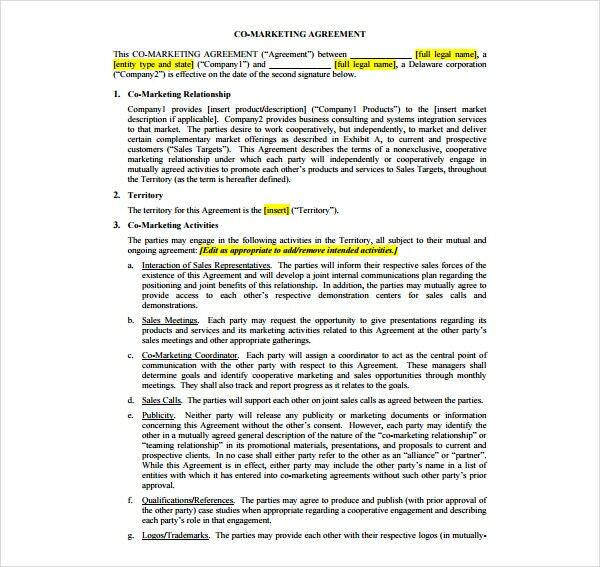 You may also see marketing agreement templates for a restaurant. 3. Bigger reach and gaining a prestigious status. Some small companies go into joint marketing agreements with big businesses to have a bigger reach of their products. It also increases their popularity standing among the masses. Moreover, getting into this kind of agreement is a way for smaller companies to be known in the business arena. You may also see collaboration agreement templates. Joint marketing agreements allow both parties to gain more customers. You can also come up with better and more reasonable rates for the customers to spend on. The more the customers, the bigger revenue you have which you can split and use for other purposes. You may also see collateral agreement templates. They say two is better than one. When companies go into a joint marketing agreement, they are steps ahead to strengthening their brand. They have a combined strategy when it comes to branding and they are expected to handle both while the agreement is in effect. When a brand is strong, they are expected to perform well in the market and gain the people’s trust and loyalty. You may also see consultant agreement templates. We all know marketing is a huge driving force in the success of a product’s promotion and sales in the market. 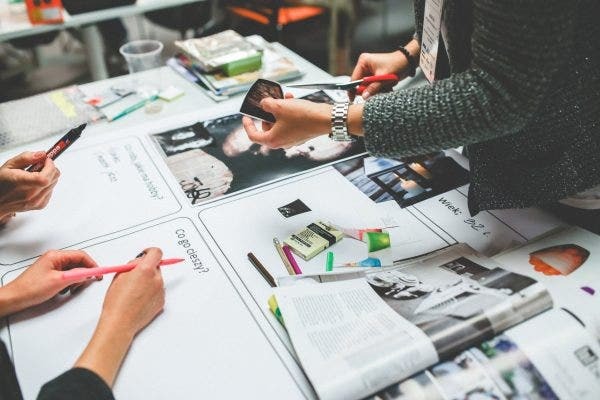 To define it, marketing is the technique of keeping and satisfying the customer by studying management and exchange of relationships. It also includes advertising, selling and delivering the products to the masses. You may also see agency agreement templates. A company has a marketing team, which is in charge of the overall grooming of the product and making it appealing to the people. They try to get the people’s attention by making slogans, advertisements (television, radio, print, billboard and online), and celebrity endorsements. Marketing maintains its relationship with the people while promoting the products of the company. You may also see reseller agreement templates. There are 4 factors to marketing. First is the product, which is anything the company sells to the people. It must be in its best quality and functions well. The product must have a unique edge over its competitors for it to do well in the market. A good product generates sales and revenue to the company of its origin. Second is the place. It refers to the distribution process of the product. The company decides whether the product will be distributed to physical stores or online shops. There is a bigger chance of reaching a wider and more diverse audience if the product is distributed on both mediums. You may also see partnership agreement templates. The third factor is the price. This refers to how much the product is sold for. A product with a reasonable price and good quality gets to be sold faster. Some products are expensive but worth the pay if it works well. Some products are cheaper than its similar counterparts. It all depends on the quality, and how much a person can afford to pay. You may also see cooperation agreement templates. The last factor is a promotion. These are the activities done to boost the sales of the product. Promotions include making advertisements for television, radio, online, print and billboard. For television and radio, a 30-seconder to one minute and is good enough for a product. Companies will pay for the airtime of their advertisements, with the aim of getting more sales. Jingles, catchphrases, and slogans are created to get people’s attention. In return, the money they pay adds more revenue to these stations. The frequency of playing the ads in a day depends on the deal. You may also see free sample agreement templates. For print ads, companies have to pay for space they have to fill in the local paper. When making a billboard, an excellent skill in graphics is needed to create a striking ad. Companies pay for the billboard space they are going to occupy. It makes sure the ad can be seen by commuters by putting it beside major highways. The rent is paid on a monthly basis. You may also see service agreement forms. The digital space has taken marketing to another level. It is now easier to keep up with the customer’s demands and satisfy their needs. An online ad usually lasts from 15 seconds to a minute. It can be seen on video streaming sites like Youtube before watching the actual video you want to watch. This has been common nowadays since companies have recognized the heavy consumption of digital content by the masses. You may also see service level agreements. Another way of reaching out digitally to the masses is making online pages on social media. As you can see, every famous product has its own page on Facebook, Twitter, and Instagram. These platforms provide quick and easier interaction with its audience. They also accommodate customer complaints via direct messaging. They also publish their online ads in their pages. A product’s fate in the market heavily lies on how it is marketed. It also relies on some factors like the credibility of the product, the ad concept, and the star power of its endorser. Even if the endorser is not that famous, the product still sells using the other characteristics mentioned earlier. And how does marketing affect us? We feel the urge to buy the product after we see how it is presented to us. You may also see basic agreement templates. An idea can stand alone but more ideas stand stronger and better. The same goes for joint marketing agreement. A brand stands stronger when another brand backs it up. This kind of agreement works most of the time, depending on the situation and the consequences that come along with it. You may also see legal agreement templates.